Julie Fuller joined Moore Ingram Johnson & Steele in 2011. She practices primarily in the area of workers’ compensation, estate planning, and appellate advocacy. Julie received her B.S. in Business from Indiana University’s Kelley School of Business in 2005. She received her J.D. from the University of Tennessee College of Law in 2008. 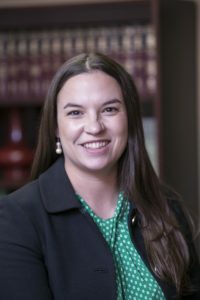 In law school Julie was a member of the Tennessee Law Review, received a Certificate of Academic Excellence in Trial Practice, and won the Judge Harry B. Laughlin, Jr. Case Note Award. She is admitted to practice before the Supreme Court of Tennessee and the United States District Court for the Eastern District of Tennessee. Julie lives in Franklin, Tennessee with her husband Gregg and their sons Jack and Sam. She enjoys travel and cooking.